The Constitution: breach of a contract ⋆ News ⋆ Official website for Oleksandr Klymenko. The Constitution of Ukraine, which was adopted 20 years ago, today is rather a symbol of democracy manqué than real effective Law for Ukrainians. More than 90% of citizens do not know their rights and fundamental freedoms (or partially aware of it) in the country, where the force of law was replaced by use of force. After all, what’s the point to have if it is not fulfilled, if the word “Law” sounds like mockery in Ukraine? All of us sacrifice part of our freedom for the sake of our country. We pay taxes, serve in the army, comply with laws and generally accepted rules. This is –a part of our obligations. Consequently, we have the right to demand from the power to fulfil its part. In particular, it comes about real actions, not the papers, which guarantee our rights and freedoms. This is the basis and inviolable truth. Violation of provisions of the Constitution cannot be justified by anything. It cannot be justified by neither war, nor political expediency, nor ideology, nor economic problems. This law is essential for ensuring stability of the state in any situation. All civilized countries are living this way. Its strength is in the fact that neither the authorities, nor society transcend borders, which were agreed before. Regardless of the circumstances. The Constitution – is the centre of gravity of the state. If it is not followed, the balance will be infringed. The country begins to “storm”, it becomes unstable. Unfortunately, it comes about similar course of events in Ukraine today. Trusting populists, people tacitly agreed the replacement of the force of law by use of force. Plethora people are waiting for a better life after it. There will be no improvement. Living standards are growing up in places, where you can meet law and order, not the radicalism and populism. People live in fair and prosperous state if the government is able to do the most difficult things: not to break the established rules. 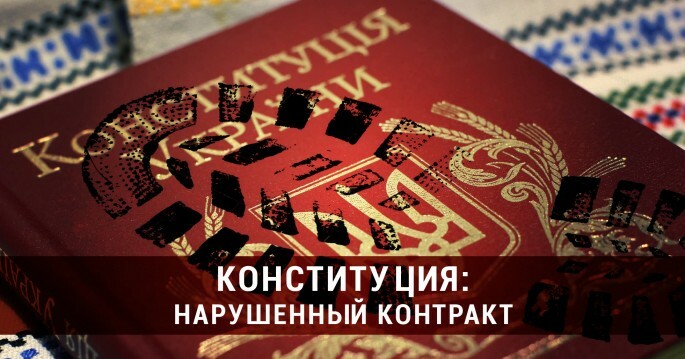 Ukrainian Constitution – is not the worst in the world. It is rather democratic. It declares the set of rights and freedoms. The problem is that it does not operate. We got used (as people from the Western world) to keep on walking behind the authorities with measuring equipment and to control: Did power exceeded the agreed limits? Is basic balance of rights and obligations of equal parties abided by them? How is it going with compliance with the Constitution in Ukraine? Let’s specify some details. Article 48. “Everyone has the right to a standard of living sufficient for himself or herself and his or her family that includes adequate nutrition, clothing and housing”. This is basic standard. Here is the reality: according to the UN statistics, more than 80% of Ukrainians live beyond the poverty line, whereas subsistence level in Ukraine approaches the poverty level of African countries. Amount of people, who do not have enough money even for food, has grown by six times during last two years. We dream about Europe. However, the reality is that we promptly approach the main indicators of Africa. It is obvious: if we have African corruption, African legal culture, African attitude to natural resources and the attitude of African “leaders” to their countrymen. It is impossible to live geographically in Europe, and mentally in Africa. “Your home is where your heart is.” If you have Africa in your mind and heart, geography cuts no ice. Article 46. “Citizens have the right to social protection that includes the right to provision in cases of complete, partial or temporary disability, the loss of the principal wage-earner, unemployment due to circumstances beyond their control and also in old age, and in other cases established by law”. Nowadays, millions of people are discriminated. In fact, they are deprived of the right to social protection. IDPs and civilians of uncontrolled territories are deprived of social support. Although they are citizens of their country. Even convicted criminal is not deprived of a pension or financial assistance. According to the state, it appears that residing in Donbas – is much more severe crime than aggravated murder? Those, who are sent by Ukraine to make a war, are also discriminated. Plethora soldiers complain that they cannot obtain payments for their injuries or other damage to health. Families of dead soldiers have troubles related to their loss. However, even people, who still receive payments from the state, are deceived. The subsistence minimum, which was established by the Verkhovna Rada, is twice lower than real needs of Ukrainian pensioners, disabled or unemployed. Article 49. “Health protection is ensured through state funding of the relevant socio-economic, medical and sanitary, health improvement and prophylactic programmes. The State creates conditions for effective medical service accessible to all citizens. State and communal health protection institutions provide medical care free of charge; the existing network of such institutions shall not be reduced. The State promotes the development of medical institutions of all forms of ownership”. Do you know a real amount of people, who got completely free medical care? Total: 3.8%. Meanwhile, during the polls 92.6% of Ukrainians confessed that they were treated at their own expense. It means that they paid for all medical supplies and necessary materials. Article 53. “Everyone has the right to education. Complete general secondary education is compulsory. The State ensures accessible and free pre-school, complete general secondary, vocational and higher education in state and communal educational establishments; the development of pre-school, complete general secondary, extra-curricular, vocational, higher and post-graduate education, various forms of instruction; the provision of state scholarships and privileges to pupils and students. Citizens have the right to obtain free higher education in state and communal educational establishments on a competitive basis”. Numbers demonstrate significant fulfilment of this provision: 84% of parents state that they are required to pay money at schools. Article 34. “Everyone is guaranteed the right to freedom of thought and speech, and to the free expression of his or her views and beliefs. Everyone has the right to freely collect, store, use and disseminate information by oral, written or other means of his or her choice”. Article 39. “Citizens have the right to assemble peacefully without arms and to hold meetings, rallies, processions and demonstrations, upon notifying in advance the bodies of executive power or bodies of local self-government. Restrictions on the exercise of this right may be established by a court in accordance with the law and only in the interests of national security and public order, with the purpose of preventing disturbances or crimes, protecting the health of the population, or protecting the rights and freedoms of other persons”. I have personal experience in processes of protecting these rights in Ukraine. 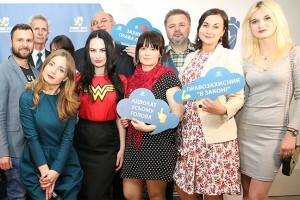 When our «Uspishna Kraina» party carried out business forums in different regions in order to work out new fair tax code, the majority of these events were disrupted by radicals. People, who were attempting to express their grievances to authorities, who were demanding justice, were beaten, humiliated and insulted. Nobody was punished for it. Law enforcement agencies were inactive. Power is rubbing its hands. They did not deal with their opponents by themselves. It is similar to other cases. Nobody prevents radicals, who decide by themselves, who has the right to public position in this country. This trend is very dangerous. If nobody is allowed to express own opinion, it will appear that no one can do something. There can be no development in constrained society. There are no prerequisites to success. This is what exactly Constitution tells us. We have to protect and defend such freedom for everyone. And it should be done on a regular basis. Not only during the Day of the Constitution. Each day should become a day of the Constitution. It should be not just a cause for celebration, but the reason to remind everyone about existence of the main principles upon, foundation of the stability of society and confidence in future of every person.